This paleo quiche is packed with veggies and made from all clean eating ingredients! 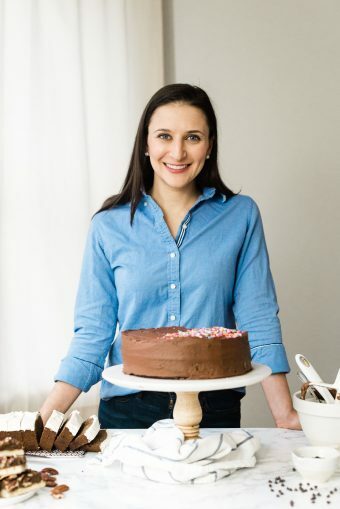 It’s gluten/grain free, dairy free, whole30 compliant, and delicious! The best dishes are the ones that can do double duty, and if you can find one that does triple duty, well, then you’re in business. 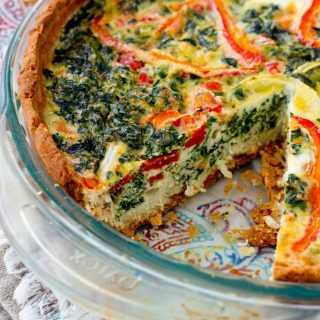 After extensive research, I can assure you that this paleo quiche works equally well for breakfast, lunch or dinner and it’s one that can be found in my fridge or freezer pretty much constantly. As you already know, I eat a ton of eggs. They are nutritious, high-protein and (for me) gentle on the stomach. Sometimes they’re not enough on their own – not hearty, or flavorful, or nutritiously diverse enough – and something you just want to throw everything in a pan, put it in the oven, and have a few days’ worth of meals ready to go. Not only is this quiche a great make-ahead dish, it is also usually the first thing I make when I am doing a little Sunday meal prep because it’s a perfect vehicle for cleaning out the fridge. Whatever fresh veggies aren’t going to make it through the week usually end up washed, chopped and thrown into this quiche. Frozen (defrosted and drained) veggies work great too, and in fact, I rarely have leftover fresh spinach so I nearly always use defrosted frozen chopped spinach to make this. Add or replace the red peppers with zucchini, asparagus or mushrooms. Replace the onion with leeks. Replace the spinach with cake kale, collard greens or chard. Throw in whatever fresh herbs you have on hand (chives and thyme are my favorites for this quiche). Go the Spanish tortilla route and add thinly-sliced white or sweet potatoes. Make the (prebaked) crust ahead of time, cool completely, and tightly wrap with plastic wrap. Freeze until you are ready to make the quiche, then bring the crust to room temperature before filling. 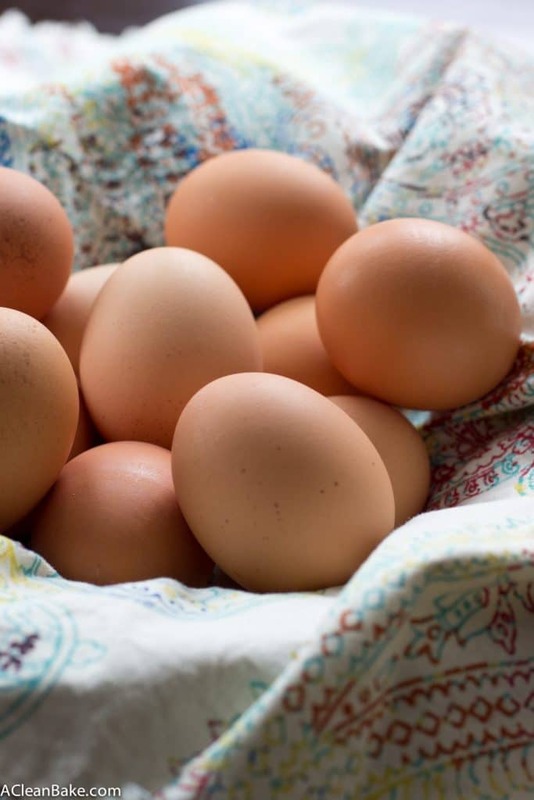 Swap in liquid egg whites for some or all of the whole eggs. I typically use a 3-6 whole eggs and the rest whites. The conversation is 3 Tablespoons liquid egg whites = 1 whole egg. If you are vegan, you can try replacing the egg with pureed silken tofu. I have not tried it with this recipe, but I know as a general rule, silken tofu works well as an egg replacement! I’ll bet there are plenty more adaptations to be made that I haven’t thought of, but those are the ways that I vary this dish most often. If you have ideas or try a variation, let me know! Toss together the spinach, bell pepper, onion, nutritional yeast and fresh herbs, if using. In the bowl that you used to mix the veggies, whisk together the eggs, milk, salt and pepper. Pour egg mixture over veggie mixture and garnish with reserved red pepper slices. Bake for 60-75 minutes or until crust is browned, top is domed and has a sheen to it, and center is firm. Cool slightly before serving, and completely before storing in an airtight container in the fridge for up to a week, or in the freezer for up to 3 months. Grain free crust recipe here. Add or replace the red peppers with zucchini, asparagus or mushrooms. If you are adding more veggies than the recipe calls for, reduce the eggs accordingly. Replace the spinach with cake, collard greens or chard. Increase the nutritional yeast or replace with cheese for a more prominent "cheese" flavor. If you increase it, you may want to reduce the salt slightly. I love how adaptable this is! I frequently make clean-out-the-fridge fritattas, but let’s be honest – quiches are more fun! Sometimes, I make this without the crust and call it a frittata, but really I always like it better with the crust! quiche is one of my favorite go to dishes. It’s so versatile and like you said easy to modify based on what you have on hand. This quiche is gorgeous. Perfect way to start the day! Thanks, Sam! I couldn’t agree more! Love that we both made quiche this week! I keep bringing in slices of mine for work lunch, mmmm. Same here! Mostly breakfast though. Thank goodness quiche is tasty AND travels well! Your pictures are gorgeous! I am also an egg nut. This is a beautiful post! Thank you so much, Whit! Quiches are my go to when there is a bunch of random ingredients in my fridge. I love the sound of this recipe! I am totally with you, Nicole! They are kind of a wonder dish, aren’t they? I love meals that are easily reheated and this one can step in for any; breakfast, lunch or dinner! I like it! Looking forward to trying the nutritional yeast. Beautiful close up, too. I can really see all the details of this mouthwatering quiche! Thank you for this, Nora! You are SO right, Traci. Quick, nutritious and reheatable foods are the best. I hope you enjoy the nutritional yeast! I know it can be kind of divisive, but I find it to be cheesy and delicious and in this case, perfect to lend a subtley cheesy flavor to the quiche. Enjoy it! You’re totally right! Thanks, Monica! You’re right! I hope you like this! 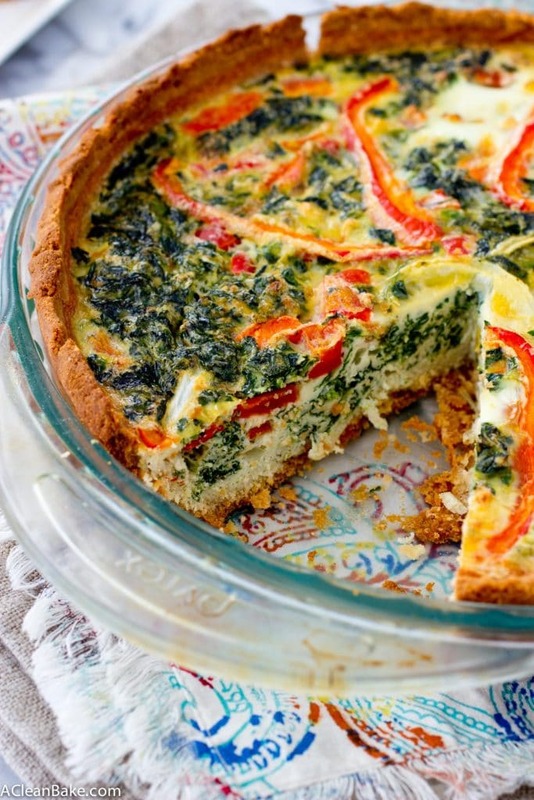 Fabulous and very versatile quiche recipe, Nora! This is a recipe I must make soon. Perfect for breakfast, brunch, lunch or dinner, like you said. Thanks for sharing and have a great week! Thanks, Stacy! I hope you like it! Thank you, Nora! This is the recipe I’ve been looking for to have with my Christmas brunch! I love the red and green colors in this quiche! 🙂 I love how you have given adaptations too! I plan to make it without the crust, since I’m having biscuits (paleo) with a baked ham and this quiche will make a nice accompaniment! 🙂 I can’t have the Nutritional Yeast (I have MTHFR), but fortunately, I CAN have dairy! Any recommendations as to how much cheese to add? I think a goat cheese would be tasty! Thank you again! If you’re skipping the crust, you may want to decrease the baking time a tiny bit, or just check on it early, to make sure it doesn’t over bake, since it doesn’t have the insulation of the crust to slow down the cooking process. But I make it without the crust all the time and it works great. As for the yeast, I would recommend using about 1/4 cup of cheese (or more, if you really, really like cheese). I love the idea of adding goat cheese. That will make the quiche so creamy! Hey there! I am trying to make this now but see the almond milk, vanilla unsweetened, is in the recipe list. However it isn’t listed in any of the instructions. Can you please clarify? Thanks so much! Hi Nitika! Yikes, so sorry! It should be added to the eggs when you whisk them with the salt and pepper. I just updated the recipe! Happy holidays! can you leave out the nutritional yeast? Definitely. Feel free to replace it with Parmesan cheese, and if not, I recommend adding an extra pinch of salt. Looks yum!! Approximately how much mushrooms or zucchini would replace the red pepper? Half cup? Quarter cup? Also, can you use fresh spinach instead of frozen? Thanks! This quiche is pretty forgiving, so I would recommend using about 1 cup of another veggie to replace the red pepper, but if you have a little more or less to use up, that’s ok too. As for the spinach, I would strongly recommend against throwing fresh spinach into this quiche and then baking it, because the moisture from the spinach will make the quiche pretty soggy. Instead, cook down your fresh spinach until you have 1 cup (it could be 5-6 cups or more fresh to get 1 cups cooked – you know how spinach is!) and then drain it as best as you can before adding it to the filling. 12 eggs seems like a lot, how many does this serve? It should serve about 6-8 people. If I’m serving it at brunch along with a lot more food, I’ll sometimes cut it into 10 slices. The reason for all of the eggs is because most quiche recipes contain a great deal of cream and cheese. Since this recipe contains neither, the eggs have to make up the volume!